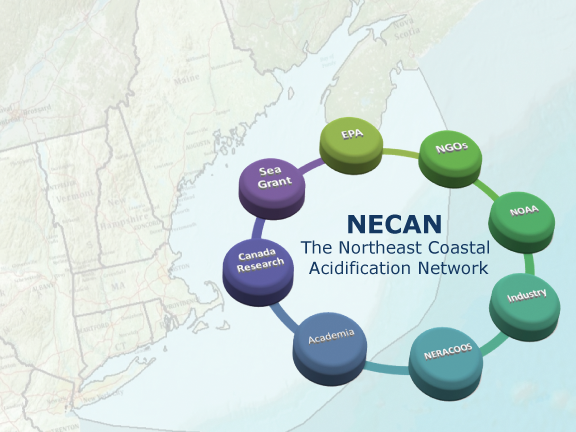 The Northeast Coastal Acidification Network (NECAN) represents a nexus of scientists, federal and state resource managers, and marine industry partners dedicated to coordinating and guiding regional observing, research, and modeling endeavors focused on ocean and coastal acidification (OCA). We focus on the waters from Long Island Sound to the Scotian Shelf, including the coastal waters of New York, Connecticut, Rhode Island, Massachusetts, New Hampshire, Maine, New Brunswick, and Nova Scotia. NECAN serves as an interface between research and industry interests and facilitates the sharing of state-of-the-science information. The overarching goal is to better identify critical vulnerabilities to ocean and coastal acidification, particularly with respect to regionally important and economically significant marine resources. Our efforts make it possible for OCA informational resources and data products to be tailored to and informed by the interests of regional stakeholders and decision-makers. We publish an email newsletter, produce publications, hold stakeholder workshops, provide webinars by experts, and help create and distribute videos. Global ocean carbon chemistry is rapidly changing in response to rising levels of atmospheric carbon dioxide (CO2). One result of this changing chemistry is ocean acidification (see Overview), which reduces surface ocean pH, increases the carbon content, and causes a decrease in the availability of ions important to shell and mineral formation. The ocean's pH has declined by 0.1 globally since the industrial revolution (an increase in acidity of about 30%) and is projected to decline by an additional 0.3 over the next century unless global carbon emissions are significantly curtailed. Data show that these changes in ocean chemistry are happening at least ten times faster than at any other time over the past 50 million years. These changes have important implications for marine life and the ocean ecosystem and, in turn, the region's economy and cultural identity. Importantly, ocean acidification conditions can be significantly altered by local processes within coastal waters. These local factors can include upwelling, riverine discharge, nutrient loading, hypoxia, organic carbon remineralization, and productivity. In some cases, these processes greatly increase the rates of local acidification. At the same time, they also offer opportunities to take local action to reduce acidification sooner than is possible through the reduction of carbon emissions into the atmosphere. NECAN works to develop a better understanding of these processes, predict the consequences for marine resources, and devise local adaptation strategies that enable communities and industries to better prepare and adapt. NECAN is part of the larger Integrated Sentinel Monitoring Network coordinated by the joint Ocean and Coastal Ecosystem Health Committee of the Northeastern Regional Association of Coastal Ocean Observing Systems (NERACOOS) and the Northeast Regional Ocean Council (NROC). To best meet the needs of stakeholders throughout the Northeast, NECAN has established a steering committee and four working groups (listed below). Each of these groups work with closely with individuals throughout the region to inform, educate, and collaborate on ocean and coastal acidification efforts. More information can be found on each of the respective working group pages. 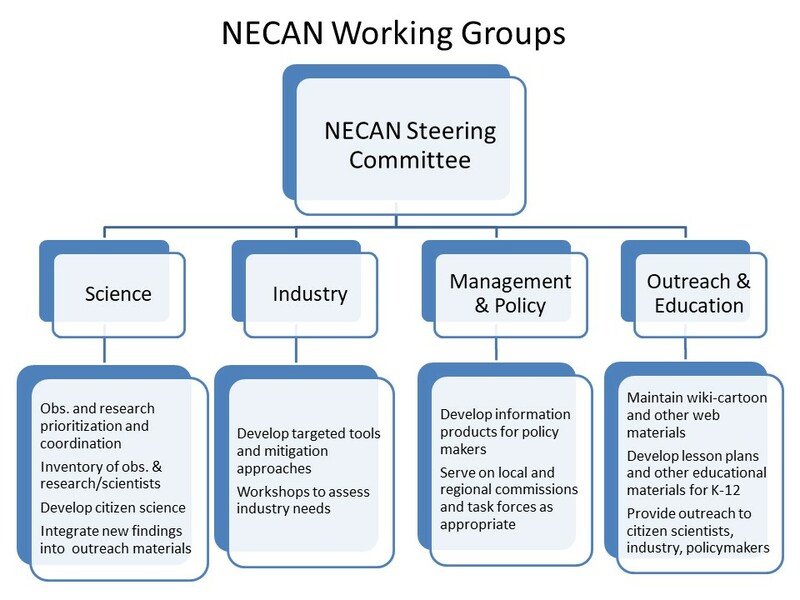 Figure 1: Schematic of NECAN working groups and their responsibilities.